I've been running for many years. I enjoy it. 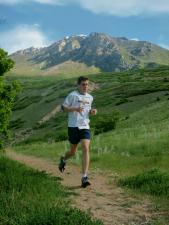 With 3 miles left in the 2010 Ogden marathon I felt better than I ever have in any of my marathons. It wasn't my fastest marathon 3:14 but the best I've ever felt. After I finished the race I kept on running & finished with 33 miles. I enjoy helping people achieve their running goals. I know how hard it is to run a marathon. In honor of my 40th birthday last month I ran 40 miles on my birthday.